4.Freely to wipe and clean than ceramic tiles, and easily to be removed. Recommended Use: Kitchen island walls, bathroom backsplashes, bedroom walls, laundry rooms etc. it can be applied to: wood, glass, ceramics, furniture, walls without dust and powder. How to install? 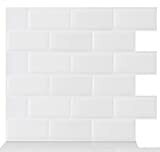 Step 1: Prepare the Wall Wall tiles should be applied to dry and clean surfaces that are free of dust and grease. Use an all purpose wall cleaner to prepare the wall. Walls must be completely dry before applying wall tiles. Step 2: Peel Off the Backing Easy Tiles are easy to apply to the wall. Peel off the backing and prepare to stick. Step 3: Align and Apply Apply wall tiles to the wall. Overlap the interlocking tiles and grout lines when installing wall tiles side by side for a seamless appearance. Press firmly once certain of placement. Kindly Remind 1.Tiles should not directly contact with flames, steam or submerse in water. Do not install tiles less than 16 inches away from the top of stove. 2.Rough surfaces such as porous wood, embossed ceramic tiles or textured wallpaper are not suitable to install. 3.The curing period is 2 days after you install them on your wall (21 days for the freshly painted walls). 4.The new arrived peel and stick wall tiles may have little gel smell. The smell will dispel in 2-3 days.